Peshastin Pinnacles Revival - NEW!! 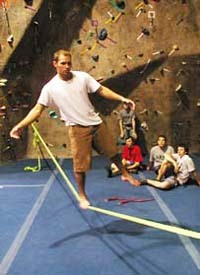 FREE Slackline Demo and Clinic - NEW!! 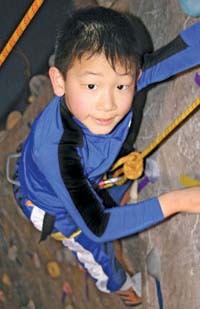 Climbing Team Update - NEW!! A bolt protected crack climb that also takes cams from one half inch to 3 inches. If you can toe jam and friction climb, you will love this very safe climb. I give it 4 stars. Don't bring your aggressive Smith rock shoes. From a recent trip report on the Edgeworks Climbing Message Board: Edgeworks climbers Mark, Christine, Eric and Austin. The Peshastin Pinnacles have a bad reputation, but I'm here to tell you not to believe it. There is some awesome climbing there, both sport and trad. Yes the rock is sandstone, and it can be crumbly in places but those places are easily avoided. 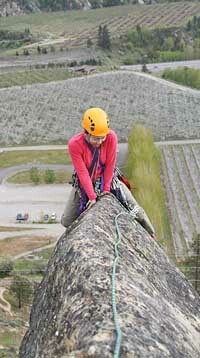 The Pinnacles are an awesome place to learn friction climbing. If you have ever done the 5.9 Bliss route at exit 38 at Gun Show wall, the Pinnacles is just like that: very smooth, leaning over friction based slab climbing. There are many routes under 5.9, enough for a couple full weekends of climbing, which is what I've been doing the last couple weekends...working on my friction technique. 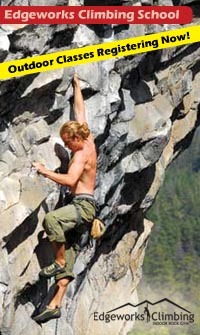 Friction climbing is completely different from steep face climbing, or crack climbing. Having your toes jammed into a shoe 2 sizes too small will not help. You need your shoe to be able to smear on the ball of your feet. Imagine standing on a very smooth leaning over slab of rock, there are absolutely no foot or handholds, all you have is the friction under the ball of your foot, and you are 5 feet (or more) above the last bolt. That's the Pinnacles. It's true that many of the routes have long run outs...but guess what, so does the Yosemite Apron, so does the Squamish Apron and many other places. Many of Victors routes up the Icicle have similar run outs. The Pinnacles has run outs on 5.4 climbs, which are so easy that you won't fall, but you will begin to get comfortable with climbing high above a bolt while keeping your cool. It tops out on a knife edge ridge that drops off 70 feet on the left, and 100 feet on the right. If you come off, you will take a very scary king swing...but no one ever has because it's only 5.6 onto the ridge, and the ridge is 4th class horse riding. There are also routes at the Pinnacles that are so closely bolted it's almost ridiculous (Potholes 5.7, West Face Grand central tower 5.8). Many of these bolted routes will also take cams to reduce the run outs (Windward Direct 5.8, Potholes 5.7, Martian Direct 5.7, Sunset Slab 5.4 to 5.9). All the bolts have been upgraded to modern 3/8 inch or larger. There are some very cool trad routes that take bomber pro and are very moderate (Porpoise 5.6, Tunnel Route 5.6, Catacombs 5.7, Vertigo 5.8). In short, don't skip the Pinnacles. Because of their undeserved reputation amongst the young sport crowd, they are usually deserted. I saw 2 other climbers on a recent weekend, and I heard Vantage was crowded. No waits, excellent climbing, what's not to like? These pictures (and more!) from a recent trip with Christine, Austin and Eric. Christine has a lot of experience with friction climbing back east and led a sweet climb called Gray Whale (5.8 old school)...glad we had a stick clip! It only had 2 bolts in 60 feet, but believe it or not, it's quite safe with a stick clip. The bolts are where you need them, but you do need to warm up your friction skills on easy stuff before jumping on certain routes. You can also easily top rope many of the harder climbs (Austian Slab, Potholes Direct, West Face Grand Central). 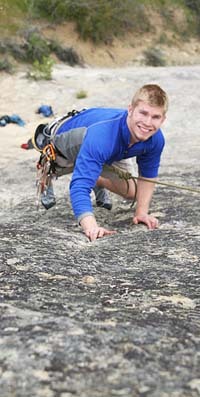 ~Thanks Mark for the great story and pics on Peshastin Pinnacles! Props to the team for a solid Sport Climbing Season! The local competitions are done for the year - leaving our kids with Regional, Divisional, and National Championships over the summer. Over this season, we've had kids finish Top 5 at every comp. 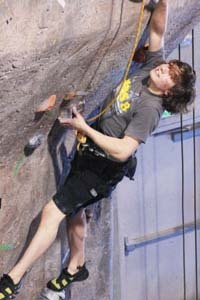 A couple of climbers are even currently Top 10 in their category at a National Level. We also have a few new team members on the Edgeworks Roster - welcome Brittany Bakken and Andrew Ira to the Edgeworks Family! Edgeworks supports the local youth through monthly High School Nights! 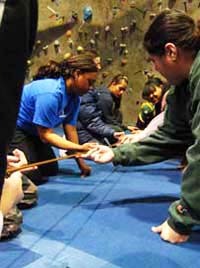 Get in at a REDUCED RATE, rentals are FREE and get a FREE 101: Knots and Belaying class. Have we ever been busy! We have set over 107 new routes since April 1st! 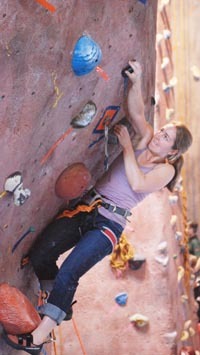 In particular, our boulder routes have been steller! Big holds up the face then crux left. Outstanding flow with lot's of body tension. Bizarre moves out of the cave. Good flow if you use good footwork. Juggy moves under the overhang, then press! No feet!? Or is there? Toe and heal hooking galore! Intense body tension with really hard top-out. Spring has sprung. School will be out soon so it’s time to plan for summer. Adults, polish your technical skills with one of our classes from our new Climbing School. Parents, don’t know what to do with the kids this summer? 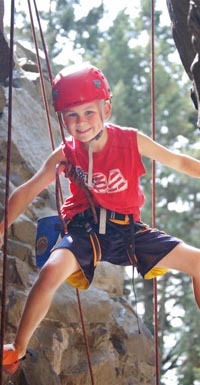 Check out our Summer Camps. What will you do if you’re partner is injured while you’re climbing? This class will address the technical skills needed to: escape the belay, set raising and lowering systems, improvise rappels, and ascend a rope.